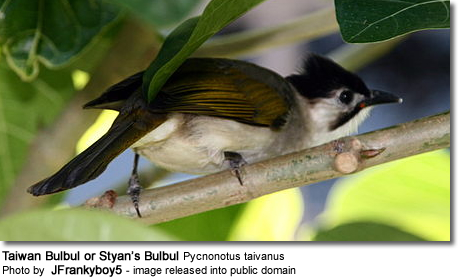 Bulbuls (Pycnonotidae) are a family of medium-sized songbirds with about 130 species in around 24 genera. Many of those occurring in forests are commonly referred to as Greenbuls. This family occurs across most of Africa and into the Middle East, tropical Asia to Indonesia, and north as far as Japan. A few species are found on the tropical islands of the Indian Ocean. The African species are predominately found in rainforest. In Asia, they are more likely to be found in open areas. Bulbuls are short-necked slender birds with long tails and short and rounded wings. In most species, the bill is slightly slightly elongated and slightly hooked at the end. Most species have olive-brown to black plumages. Although some species have colorful plumages with yellow, red or orange vents, cheeks and throats. Some species have distinct crests. Dull plumages species often have constrasting eyerings. Males and females mostly look alike, except the females tend to be slightly smaller. The vocal Bulbuls make calls that are described as nasal or gravelly. 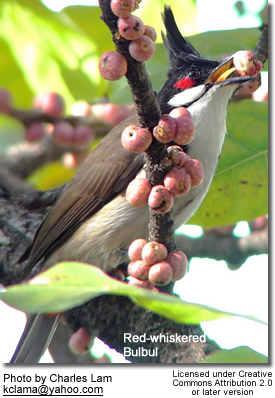 Bulbuls feed on various fruits, seeds, nectar, small insects and other arthropods and even small vertebrates. 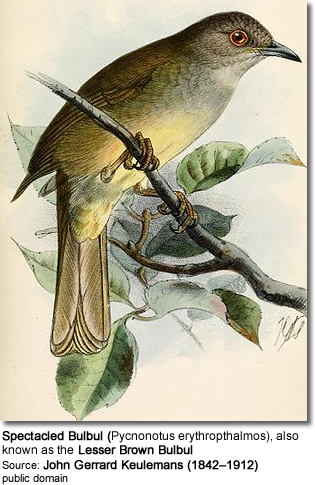 The bulbuls are generally monogamous (loyal to one mate) - the exception being the Yellow-whiskered Greenbul which at least over part of its range appears to be polygamous. Non-breeding birds in some species (often the young from previous clutches) may help raise the young of a dominant breeding pair. The average clutch consists of five purple-pink eggs. The eggs are incubated by the female alone for about 11 to 14 days. The young fledge when they are about 12 to 16 days old.